wrightwing wrote: Again with the M.85. A Flanker's corner speed is below 400kts. An Eagle doesn't have to be at above 500 to 550kts to start turning better. It'll reach parity or start turning better between 350 to 400kts. 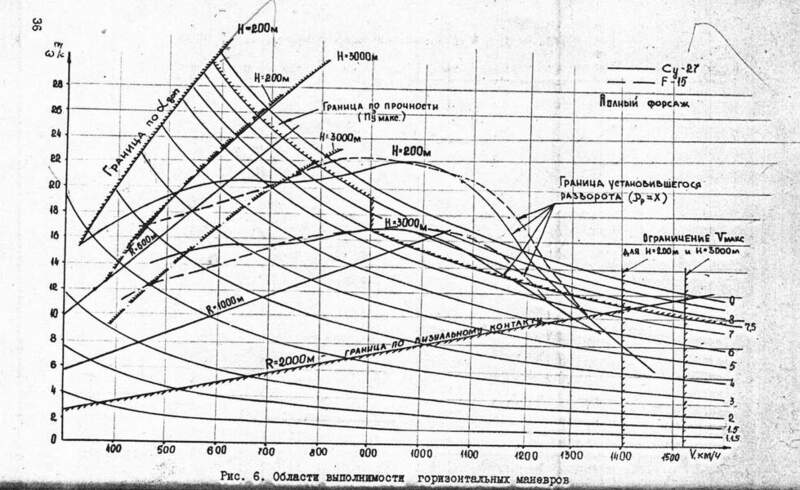 marsavian wrote: athough the Russian graph suggests instantaneous performance is better in the high subsonic for the F-15 and only gets worse in the lower subsonic. Would you good folks have any graphs for that please. I'd love to believe it, (gives me more ammunition against Flanker fans) but I'll need some sorta evidence. I'd be all for F-35 aggressors, but I guess it depends on how far your simulations go. Meaning, the USAF seems to deliberately hold back certain airframes to more accurately mimic an enemy's capabilities. For me, I would want to (if anything) over-estimate their capabilities. You know, like how many pilots said Red Flag was so much more difficult than real combat? And we've all seen the results of real combat.. So I'm unsure where the disconnect is. Perhaps there's something about air combat where you need to precisely mimic an enemy's capability, vs. being even better. It may be that being even better "throws" the simulation and results in blue force executing maneuvers that wouldn't really help them in the real world. Nobody showed anything substantial, just the raw capabilities of both planes. If you noticed it was a defensive set up where the F-15 was placed behind the Su-27. And a at a certain air speed (likely where the Flanker has the advantage), both were ordered to turn. No tactics or fancy strategies, they just wanted to see who can perform that basic maneuver better. The Su-27 ended up behind the F-15 after 1 and a half turns. I have no problem with this for 2 reasons. 1. I've long accepted the fact that the Su-27 airframe is aerodynamically superior to the F-15 in most parts of the envelope at least. It should be, it was designed about 10 years after the F-15 was. they are literally not from the same era. It benefits from advancements like Relaxed static stability, Vortex lifting surfaces and probably better body lifting properties. The fact that F-15 is still superior at very high subsonic to supersonic is a testament to the Eagle's greatness, not bad for a design 10 years older. Remember this is the plane that the F-22 was designed for. They wouldn't of kicked off the ATF program if the F-15 owns the Su-27 already. And thats not just me talking, F-15 pilots I've spoken to have mad respect for the Flanker. If I did merge with a ‘Flanker’, I’d fly good BFM (basic fighter manoeuvres). Our pilots are better trained than theirs, and that should give us the advantage in a dogfight … but if there’s one thing I’ve learned about dogfighting it’s that it’s a great equaliser, and only one of you is coming out alive. I have a lot of respect for the Su-27, from all I’ve heard about it. 2. An F-16 pilot I talked to said they did the exact same exercise with the Eagle with the same results. They placed the Viper 10,000 feet in front the eagle. Then they turned. after 1 and a half turns they were now behind. So when lbk said that I think sprinkling instability dust on an airplane makes it better. Well Frankly, yes, I mean maybe not better in all parts of the envelope, but as one of the main factors that Sprts looks at when making his calculations I would say that yes, instability makes it easier for the airframe to be more agile. P.S. Let be honest, we have some bias towards American fighters, I know I do. And one reason why it was hard for me to accept that the Su-27 was superior to the F-15 was because I don't like the idea that Russia's 4th gen was better than America's 4th gen. But then it hit me. If a war broke out in the 1980s American 4th gens wouldn't be facing Russia's 4th gens, they would be facing 3rd gen Mig-23s and Mig-21s. It would have been a massacre in the skies over Europe. Today if a war broke out, Russia's 4th and 4.5 gens will go up against 5th gens, another massacre. I prefer comparing Aircraft by era not by generation. The only era when The Russians seem to have a slight technological upper hand at least in front line air superiority fighters was in the 90s when they had some 300+ Flankers and the Raptor has yet to be produced. But that was also the time when Russia had no money to operate them in war. lbk000 already showed it to you but here it is again without the annotations. It shows two pairs of instantaneous turn rate, one at 200m height and other at 3000m height, solid line for the Su-27, dotted line for F-15 and speed in km/hr. If F-15 keeps its speed high it don't need fear any other aircraft, turning around Mach 0.8-0.9 and lots of vertical loops. O yes that one. I'm looking at the parts he encircles. I'm assuming that they are sustained turn rates and that the speed indicator below refers to knots. So on the encircled parts it shows that the Su-27 having superiority at anything below 700 knots (Mach 1). this was the high subsonic where most air combat traditionally occurred. I can't help but imagine that if the F-15 and Su-27 were to meet in the skies over Europe, would they still meet at those speeds? Eagle jocks know that they have the advantage in supersonic speeds. So if they did meet and if dogfights occurred we may have seen an era where the norm was at supersonic speeds. No, the speed chart is in km/hr as I said and as indicated by the bottom right hand corner annotation, multiply by 0.54 to get knots. Su-27 starts turning better below 400 knots. marsavian wrote: No, the speed chart is in km/hr as I said and as indicated by the bottom right hand corner annotation, multiply by 0.54 to get knots. Su-27 starts turning better below 400 knots. Finding 58th FS/33rd Wing is difficult however this post is about 'aggressor training & the F-35' so article is plonked here. "EGLIN AIR FORCE BASE, Fla. -- Instructor pilots and students from the 58th Fighter Squadron integrated with a civilian contracted aggressor squadron to conduct air defense training Jan. 24, 2018, at Eglin Air Force Base. This marks the first time the 58th FS has looked outside of Air Force units to find adversary support for training requirements. Previously, students and instructors have practiced air-to-air tactics against other F-35 pilots or a different Air Force squadron. “It provides us a different aircraft to fly against, and that’s important for us to test our system knowledge as well as our own tactics against [an aircraft] that isn’t an F-35,” said Snyder. The 58th FS produced 68 F-35A Lightning II pilots and 13 instructor pilots in 2018 but leadership is looking to increase that number and build up the fleet. Actually they didn't have technological upper hand with Su-27 even then in many areas. Su-27 is definitely very good 4th gen design aerodynamically and carries a lot of fuel internally. R-73 was also very good missile then and coupled with HMS would have been very dangerous in close-in fight. But Su-27 had substantially poorer avionics in many areas, although it definitely also had some good points. N001 radar was not nearly as good as AN/APG-63 and AN/APG-70 were at the time and was substantially worse than what the Soviets wanted. It was basically an enlarged and updated MiG-23 radar after all. CNI systems were also less capable than in F-15C AFAIK. Computing capacity and speed in Su-27 during 1990s were pretty much equivalent to what F-15A had in early 1970s. This must have presented some serious limitations in comparison to F-15C and F-15E. These limitations very likely include things like ECCM, multiple target tracking capability, track quality and better target discrimination capability. Another big thing for F-15C during 1990s was that it had AMRAAM for BVR whereas Russian jets only had a handful (in whole Russia) of R-77s and just used R-27s. This would've been pretty big differene between the two jets. I'd take even AIM-7M/P over R-27 variants. So I think during 1990s F-15C would've had the upper hand in SA (even without AWACS) and BVR engagements. Thus they would've pretty likely had the upper hand overall. I think Su-27 would've presented some pretty nasty surprises though. I still think that F-15 can mimic Su-27 pretty well during most likely parts of air-to-air engagements. In Close-in WVR fights F-15 might not have exactly similar strengths and weaknesses but still close enough in many respects. Actually they didn't have technological upper hand with Su-27 even then in many areas..
well yes, but like the F-15 pilot above put it, the Su-27 earned their respect. an F-22 pilot wouldn't be as respectful in my opinion. It's good that spazsinbad posted that picture of Carlos Condit who was and still is, but not nearly like he used to be) pretty damn good MMA fighter. MMA fighters (or boxers or other full contact fighters) definitely don't have anybody to replicate exactly what their next opponent is like. They however can train very effectively by training with multiple people using different styles and having different body compositions. If facing a great boxer with good wrestling skills, the training partners don't need to be good in both boxing and wrestling. Those skills can be trained very well with people that are great in one art. hornetfinn wrote: It's good that spazsinbad posted that picture of Carlos Condit who was and still is, but not nearly like he used to be) pretty damn good MMA fighter. MMA fighters (or boxers or other full contact fighters) definitely don't have anybody to replicate exactly what their next opponent is like. They however can train very effectively by training with multiple people using different styles and having different body compositions. If facing a great boxer with good wrestling skills, the training partners don't need to be good in both boxing and wrestling. Those skills can be trained very well with people that are great in one art. It's also important to note that while aggressors at Red Flag mimic threat tactics and capabilities, there's lots of other DACT/ACM training, that's no holds barred. Our 4th generation jets get to practice against F-22s and F-35s, as well as against Typhoons, Rafales, Gripens, Fulcrums, and Flankers. The increasing use of simulators will also allow more complex scenarios/threats, in addition to live training. Like you said the N001 was based on the Mig-23 radar. Or to be more precise, the Mig-29 radar - the N019 - was based on the Mig-23 radar while the Su-27 radar - the N001 - was basically an upscaled (namely with a bigger antenna) of the Mig-29 radar, the N019. And then we all know how "good" that Mig-29 radar was even back then (sarcasm). Besides and if I'm not mistaken, I remember to have read somewhere that according the the Soviet doctrine during the late 80's/early 90's the only fighter aircraft that could or would operate without Ground Radar (GCI) or AWACS support - or resuming only with its own radar/sensors - was the Mig-31. Specially if we start coming up with multi-mode radars such as the APG-70 (F-15E), APG-73 (F/A-18C), APG-68 (F-16C and F-16A MLU), etc... together with much more advanced Electronic Warfare suits/ECMs, etc... and also cockpit displays with actual MFDs (Multi-Function Displays) which was something completely "Alien" to the Soviets/Russians during that era and etc, etc and etc... it's not hard to figure out that it was exactly the opposite - the technological upper hand was basically all on the US/NATO side.